Also several of the pictures are from Railpictures.net and the credit is on the picture itself. 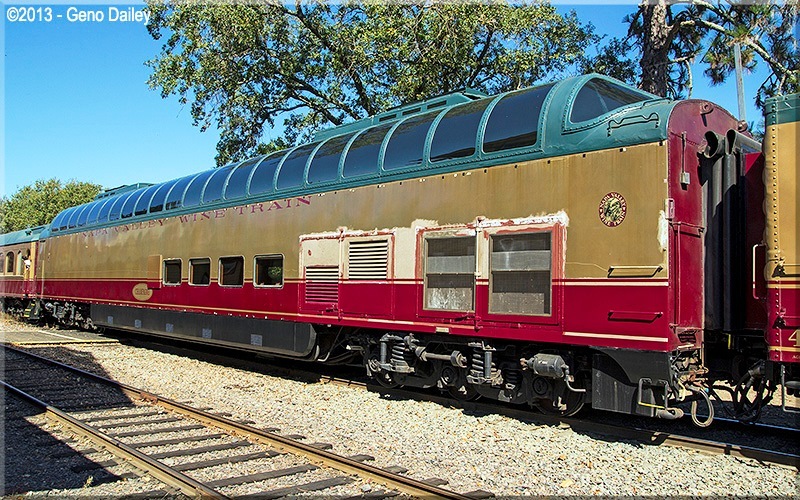 Not Santa Fe, but I have ridden it several times and it appealed to me, especially since Aristo Craft did make rolling stock with the proper scheme. Aristo did also make a lot of other rolling stock with this paint scheme, but never existed in reality. 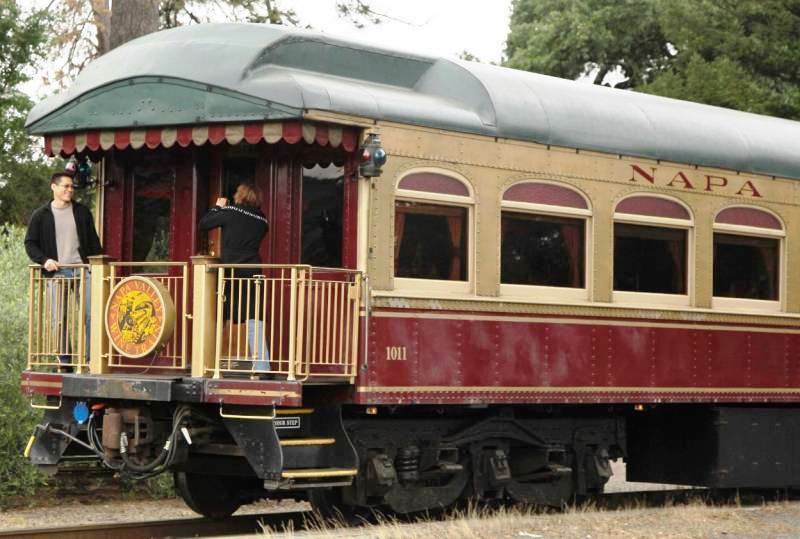 The rail line was build in 1864 by San Francisco's first millionaire, Samuel Brannan, to transport visitors to his spa resort of Calistoga. 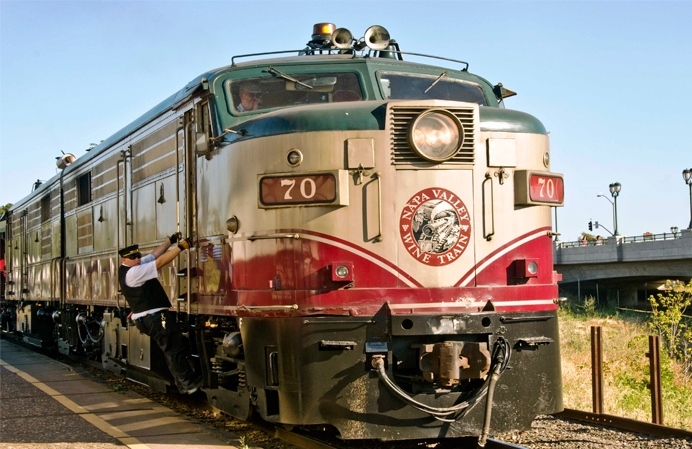 42 miles of track ran from Calistoga to Vallejo, where it connected to the San Francisco Bay Area ferry boat service. 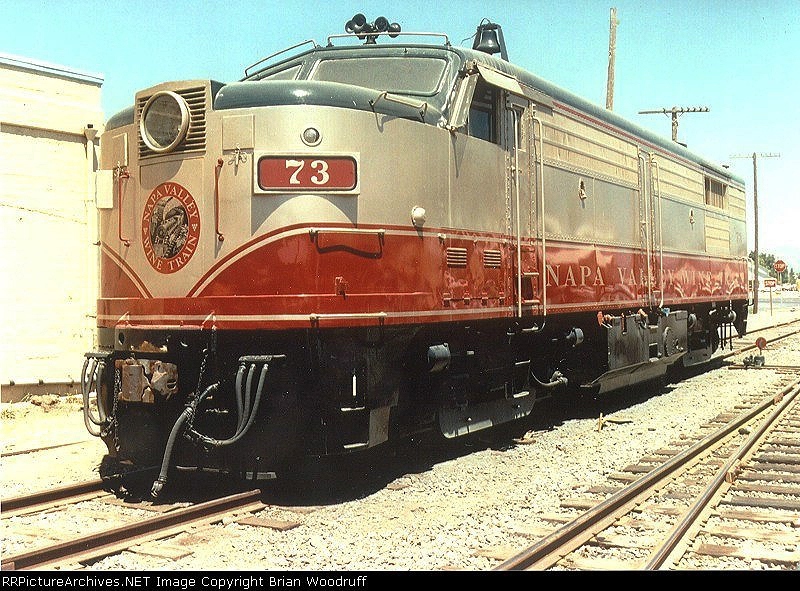 There were many changes over the years, culminating in the NVRR company in 1987, purchasing the right of way from the current owner, Southern Pacific. The consist have varied over time, indeed, there was a large box car between the two locomotives for some time, see the picture of #71 above. I have tried to keep this to the consist as of 2017. The super dome car was added in 1997. 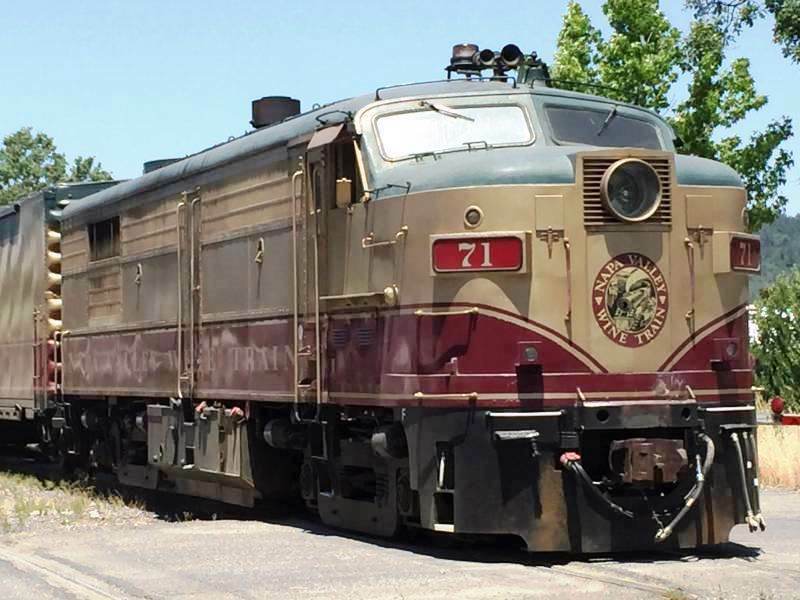 A modified box car containing a 450KW generator was added in 2013 to maintain power as locos were switched to the opposite end of the train at the end of a run. The roof of this car was lowered 2 feet to not obstruct the view from the super dome. 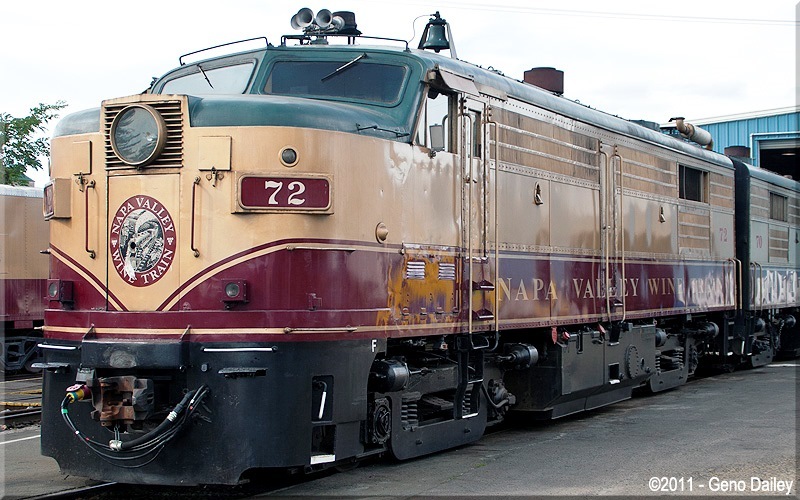 The train operates a 3 hour long trip of 36 miles between Napa and St. Helena. Start with Aristo FA-1 loco, available in NVR decoration. I have #70 already. Start with Aristo FA-1 loco, available in NVR decoration. I have #71 already. # 1090 - Le Chef de Cuisine kitchen car ?? need pullman with no windows one side? # 1085 - Champagne vista dome- dining downstairs, kitchen downstairs LGB or custom car? 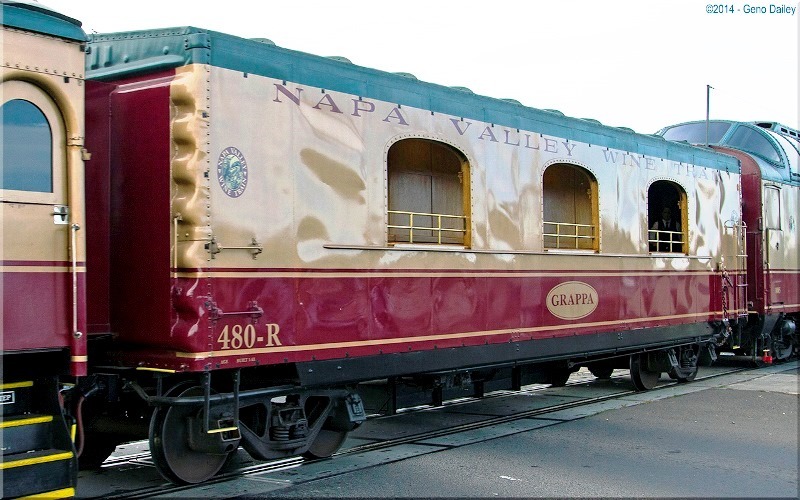 # 1014 - Zinfandel Lounge car, arched windows pullman?